For many who cruise the West Coast, the lure of sun and tranquility in Mexico and points south is very compelling. Others, including me, are drawn to the Pacific Northwest and the overwhelming beauty of Puget Sound, the San Juan and Gulf Islands, British Columbia, and Southeast Alaska. But in between lies another appealing cruising groundthe coasts of California, Oregon, and Washington. Heading north up this 1,300nm route can be challenging; you are nose to the weather all the way, and the dynamics of sea and weather conditions increase with latitude. 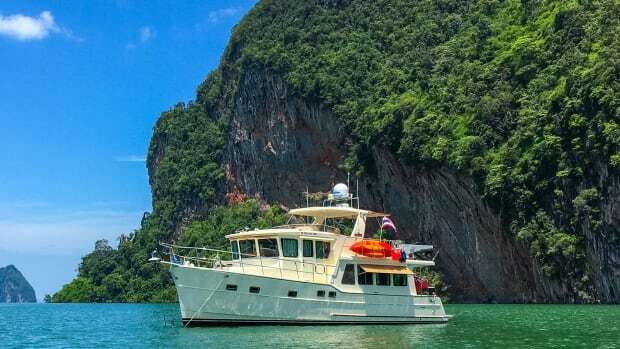 These waters are safely cruiseableif you follow good planning and preparation procedures and common sense, this is a doable and fun adventure. I singlehand, so stopping every night is part of my plan, as are early-morning starts and finishing boat work by early afternoon when possible. With a bicycle on board, the rest of the afternoon and evening is my time to explore the towns and surrounding areas. As always, weather is a constant companion. You will receive continuously transmitted NOAA marine weather on VHF, and NOAA also posts multiple websites that are very informative and display weather in a variety of graphic formats. My old favorite is Dial-A-Buoy (see http://www.ndbc.noaa.gov/dial.shtml)with a simple call on your cell phone (no apps, no Internet), you can get real-time readings from every NOAA or Scripps Institution weather buoy on the Pacific Coast. Quick and easy. I use the info to establish patterns 200300 miles in front, supplementing the four-times-daily updates to VHF weather. When cruising these parts of the Pacific Coast, weather holds will be part of the game. I pilot a small boat (32 feet), and I err on the side of caution when it comes to making go or no-go decisions. I also take seriously the lessons Ive learned from making the wrong call. At the end of the voyage is a paradise for cruisers and memories of a lifetime. And, when starting the return trip, it will be all downhillin a good way, of course. San Diego lies 11nm above the Mexican border. (Mileages listed here are averages based on multiple trips.) If you are foreign flagged or returning from Mexico, your first stop will be the customs dock on Shelter Island. As is standard practice, expect to have chicken, eggs, and fruit confiscated. San Diego is a beautiful city with great weather and a wealth of attractions, but it can be difficult for visiting boaters. Anchorages and near-city guest slips are limited, and what is available is expensive. Kona Kai Marina, just north of the customs dock, is a good first try. You can also hop over to the Glorietta Bay anchorage and drop the hook near the beautiful Hotel del Coronado. Departing San Diego Bay, I fishhook around the kelp beds off Point Loma and head 78nm north to Newport Beach. The harbor maintains just a few guest slips, but the general anchorage near waterfront homes is scenic and quiet. This is a terrific fuel stopHills Boat Service on Balboa Peninsula offers a double whammy of low prices and full service. They are nice people, to boot. Marina del Rey is a huge man-made harbor 47nm to the north and an ideal spot to prep your boat for the run to San Francisco. Nice guest docks abut Burton Chace Park on the main channel. A short walk takes you to a shopping center with grocery stores, restaurants, a post office, a bank, and a West Marine. The beachfront bike path runs right through the marina. Heading south takes you to Manhattan Beach, Hermosa Beach, and Redondo Pier, while the northbound route offers the eternally picturesque Venice Beach Boardwalk and Santa Monica Pier. Leaving del Rey, you will run 72nm to Santa Barbara, the jewel harbor of Southern California. This is as perfect as it getsideal weather, beautiful sights, central location, and a vibrant waterfront. World-class public transportation puts downtown, the Mission, and cultural attractions at your fingertips. Theres a West Marine in the harbor, and drinks and dinner at Brophys will brighten anyones day. The next stop is Cojo Anchorage at Point Conception, about 40nm away. While passing Coal Oil Point, that is exactly what you will smella natural seepage of oil. If you choose to bypass Santa Barbara, it is a 105nm ride from del Rey to Cojo. 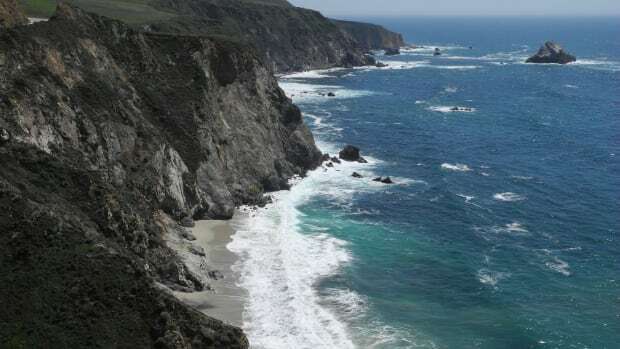 The upcoming Big Sur and Central Coasts have three natural gates to deal with: Points Conception and Arguello (11nm apart) and Point Sur, just below Monterey. All three are large, protruding land masses, disruptive to wind and sea patterns, and often wickedwashing-machine-type wicked. There are strategies for transit, and mine is simple. I do it at dawn, after the wind and seas have laid down overnight, adjusting my previous harbor departures accordingly. Cojo Anchorage is directly in the lee of Point Conception, so its a good spot for monitoring the overnight winds and hitting the road at first light. Continuing northward, the dynamics of the trip start to change. Turning 90 degrees to starboard, you will be totally out of the lee-protected Southern California waters and exposed to unhindered ocean swell. Outside marine assistance becomes more remote, so the boats protocol for safety and emergencies must rule the nest. However, tHoHhe coming daily runs are not crushers (80100nm), and there will be plenty of aft-deck time ahead. Morro Bay is the next leg, 65nm ahead. As will be the case with many other west-facing harbors up the coast, this can be a difficult entrance if seas are up. I always pull in here for fuel and, depending on conditions, either stay or continue on 28nm to San Simeon. (If you do fuel up, dig out the old docklines; its easy to pick up a patch of creosote from tying to the fuel pier pilings.) There usually is a mooring ball open at the Morro Bay Yacht Club (for non-clubbers as well), and the general anchorage is no problem. Dinghy docks are along the shoreline. This is a charming town and waterfront, with all types of services availablewell worth a visit. Dont miss the fresh fish from Giovannis Fresh Fish Market & Galley on the Embarcadero. Upcoming Point Sur is gate no. 3, and a prime focus in deciding when to run the Big Sur coast. Scripps maintains a sea-state buoy near the point (no. 46239), and NOAA provides hourly updates, a great help in planning when to leave Morro Bay. San Simeon Bay, located just below Hearst Castle, is the jump-off point for the 85nm run up Big Sur to Monterey. Its a pretty anchorage, very reminiscent of the Northwest, but the bight is not deep and often is roly. There is substantial kelp just west of the entrance. Since I usually leave in the dark, I take a good look at the layout on arrival. Past experience has given me the ultimate respect for Point Sur, perhaps more so than the other two points. I prefer leaving San Simeon at night to plan a dawn passing (its about 58nm). If preference or conditions preclude a night trip, then you are aware of any potential hazard ahead. This is a frequently foggy coast, but it is majestic on a sunny day. Monterey is my favorite harbor of the entire tripthe perfect place to get stuck waiting for a weather window. The harbor district is efficiently run and staffed by helpful, friendly people. The harbor itself is busy with lots of commercial traffic, and the waterfront is scenic and bustling. The adjacent museums and old fish canneries to the south are brimming with early California history. Other highlights of Monterey include fresh local calamari on the wharf, coffee in the sun on Cannery Row, and a ride down 17-Mile Drive to Carmel. Dont miss the Monterey Bay Aquarium, where you should try to spend at least half a dayit is unmatched on the entire coast. Take a look at the live webcams of various displays on their website (http://www.montereybayaquarium.org/efc/cam_menu.aspx). From this point forward, accurate tide and current data is critical. San Francisco is the first of many west-facing harbors you will encounter with heavy sandbars at the mouth, created by silt flowing downriver. Here, it extends in a fan several miles out from the Golden Gate. The best crossing time is on the back of a flood tide; the worst time to cross is on a max ebb current, meeting the incoming seas and causing a mess. This is a busy commercial harbor, and also the convergence of three offshore shipping lanes. You can enter the harbor without crossing any lanes, but inside the bay are multiple lanes that require strict attention. Traffic outside the gate is updated at 15 and 45 minutes past the hour on Channel 12. San Francisco Vessel Traffic Service, handling ferries and commercial shipping inside the bay, can be found on Channel 14. In San Francisco, I am a longtime docker at Pier 39, by the end of Fishermans Wharf. There can be surge on occasion, so I add a second dockline with a different diameter to each cleatthe dissimilar rate of stretch acts as a snubber. Pier 39 and the waterfront is a vibrant and lively area, teeming with restaurants, attractions, and services. Head up the hill to old-school North Beach and have a cocktail at Amante on Green Street, then walk over to the Original U.S. Restaurant on Columbus Avenue for dinner. If you are in town on Saturday, dont miss the Ferry Plaza Farmers Market at the Ferry Building. In Part II of this article, well continue up the Pacific Coast to Cape Flattery, Washington, stopping in Bodega Bay, Coos Bay, and more.